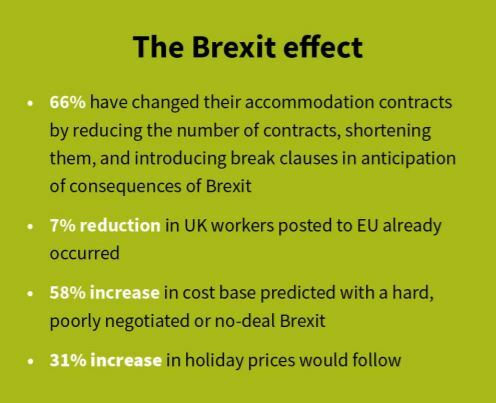 The organisation Seasonal Businesses in Travel, or SBIT, have been working hard to make sure their message gets out about the risk to British companies and jobs from Brexit. Their latest release, in August 2018, warns of a ‘looming crisis’ and the possible impact of a ‘No-deal’ or ‘Hard Brexit’ when Britain leaves the EU. The main concern of SBIT is that there is little awareness that the cost of holidays to British skiers and snowboarders is likely to rise significantly. They suggest that the companies ‘most likely to cease trading’ are small and medium sized operators. SBIT estimate that the UK ski market is worth £3 billion to the British economy and that this value is already in decline as operators have cut the number of properties offered and staff employed in ski resorts. SBIT are not just concerned with the ski industry, but all seasonal businesses and the staff that they employ. They claim previous industry surveys have suggested that at least 25,000 UK citizens work in the EU supporting the outbound tourism industry. The SBIT survey covers companies who employ around 6000 members of staff ‘seconded’ to the EU, but employed in the UK. SBIT argues that as employers pay UK social charges – which are lower than those in Europe – the cost of the holiday is kept low. Their survey of 134 companies suggests that there would be a 58% increase in costs in the event of a hard Brexit – and inability to ‘second’ staff to the EU – and a 31% increase in prices. Can UK companies adjust their traditional ‘chalet holiday’ model? Whether or not this system of secondment is legal is a matter of debate that crops up repeatedly, as local employers have reasonably argued that it is unfair that British companies do not have to pay the same taxes that they have to. Certainly, many British holidaymakers might prefer British staff in resort, but the Club Med model – which is quickly gaining share in the UK ski market – demonstrates that that there is a growing proportion of UK skiers happy to be looked after by their multinational GOs (Gentil Organisateurs). What is without doubt is that unless the British public has a change of mind – with the faint hope that a second referendum could despatch Brexit before it ever happens – ski holidays will become more expensive, especially if you want seasonal chalet staff and reps to look after you.